In case you don't already know, I LOVE globes and maps. I've always loved traveling and my list of places I want to visit is constantly growing. 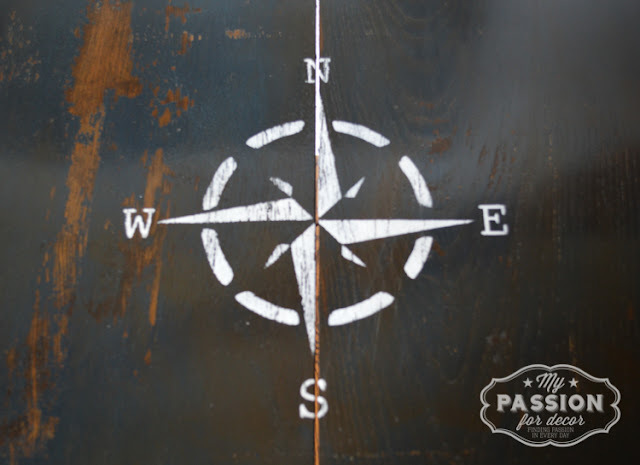 Maps and globes inspire me, the colors and the endless possibilities of places to explore. One of my favorite quotes is, "Oh darling, let's be adventurers." I tell the hubby all the time, I want to sell everything we own and travel. We could home school Hunter and live a simpler life, while traveling the world. Great idea, right?!! Well, obviously this idea wasn't taken seriously by the hubby because we're still here and not off traveling the world being adventurers! Anyway, let's talk about this project shall we? I bought this drop leaf table at an estate sale recently. I hate to admit this, but I make mistakes....a lot of mistakes. You're not surprised are you? Well, this cute drop leaf table was stuck in a corner at the estate sale. The people running the sale were smart, they put the 'bad' side of the table to the back so it couldn't be seen without some Macgyver maneuvering. I love drop leaf tables and had to have this one. All I could see were the possibilities! I could see how great it would look all done with a stained top and off white legs. HA HA HA those estate sale people got me! I didn't realize how much I'd been had until I got the table home. After careful examination, I saw the back leaf, that had been stuck in the corner, wasn't an original part of the table. It didn't even match the router edge. That was only the beginning! I was dead set on staining the top of the table. Since the one leaf wasn't original I thought it would be best to take them both off. That took a lot of work and there might have been a few choice words spewed whilst doing this part. Here's how the table looked when I brought it home. You can see in the picture on the left where the leaf was added. After removing both leaves, I began sanding the table top. I started with 80 grit sand paper due the fact the top was pretty messed up. I then changed to 120 grit then 220 grit. I still had hope the table top could be saved. Remember when I wrote earlier how the estate sale people were smart? Yeah, well they were smarter than I was that day! The top of the table had been burned by setting things on the top without trivets....at least that's what I think happened. Instead of realizing that perhaps I should give up on staining the top, I stained the top with jacobean and then dark walnut stain. I let the table sit overnight, hoping it would look beautiful when I woke up the next morning. I woke up and checked on the table, crossing both my fingers and toes, and the top was U G L Y. I let the table sit a couple more days until I finally came to the realization I'd been had. I was sad to admit it, but I had no other choice but to paint the table top. Life lesson!! Examine everything before you buy! If it's in a corner, ask the people running the sale to move it out so you can check the entire piece of furniture. If I'm being honest with myself, even if I had seen the imperfections, I probably would have bought the table anyway. I'm a sucker for an ugly duckling. After some sulking on my part, I put my big girl pants on and painted the table. 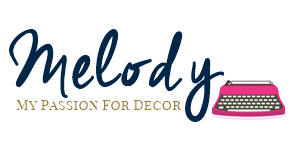 I used my favorite color of Miss Mustard Seeds Milk Paint, Artissmo. It's a beautiful deep navy/midnight blue color. I hadn't intended to use this color on the table, but I went with it and the whole project went in a completely different direction. It all fell into place and the travel inspired table began to come to life. I painted two coats of Artissmo on the entire table. As milk paint does sometimes, it flaked giving me the look I was going for. I sanded and distressed the table top and legs. I used a putty knife to get all the flaking paint off and sealed the whole table with Miss Mustard Seeds furniture wax. This will always be my favorite wax.....it goes on like butter. Once the table was done, I needed some chairs. I had two solid wood school chairs that I'd moved from Connecticut sitting in the basement. 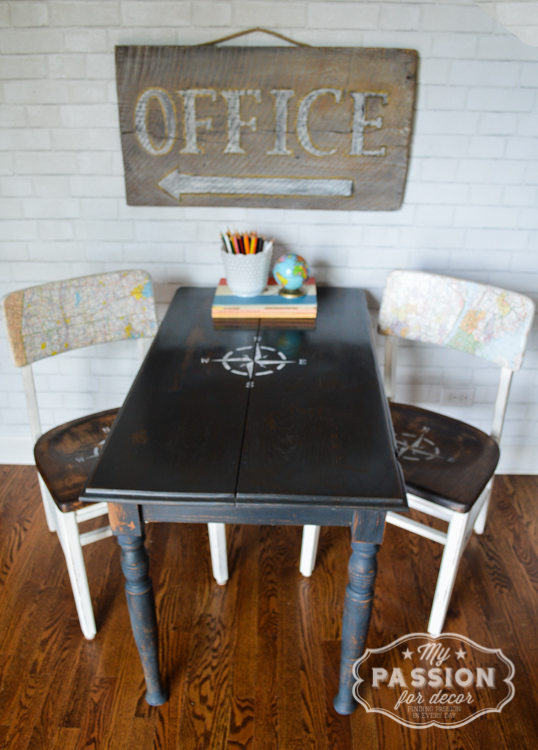 I had a vision for the chairs and this vision worked great with the travel inspired vision I had for the table. 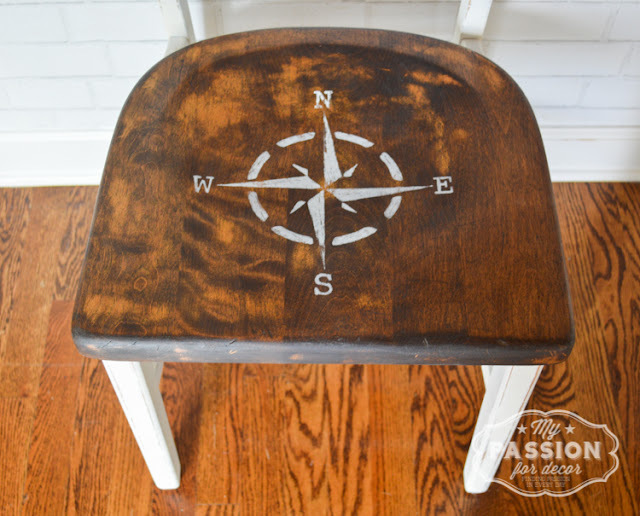 I removed the chair seats and sanded them down, then stained them using a mix of jacobean and dark walnut stain. If the table top couldn't be stained, those seats would be!! I painted the rest of the chairs in an off white matte finish paint. 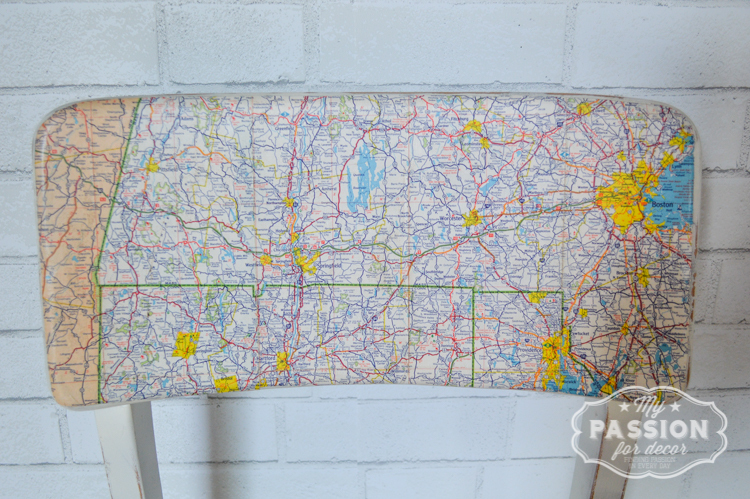 On the front of the chair backs, I decoupaged vintage gas station maps from NY and CT on each one. 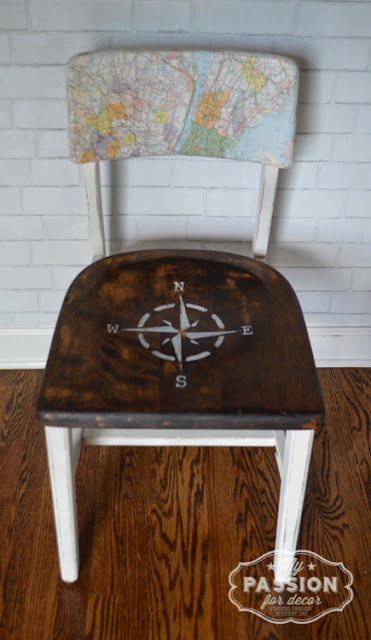 To go with the travel theme, I added a nautical compass stencil on the table top and on each of the seats. 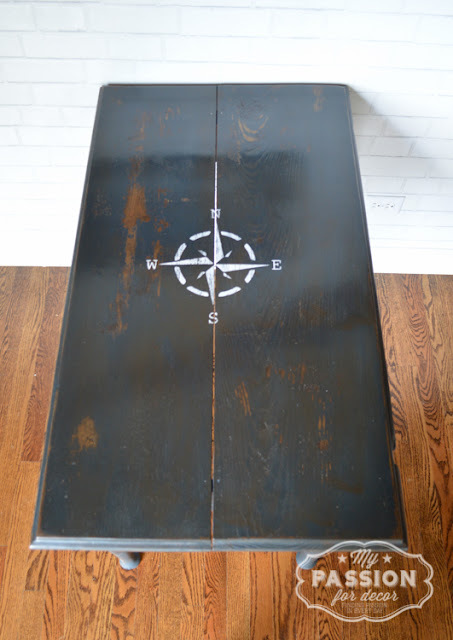 This pain in the rear table turned out so cute! I really love how it turned out! 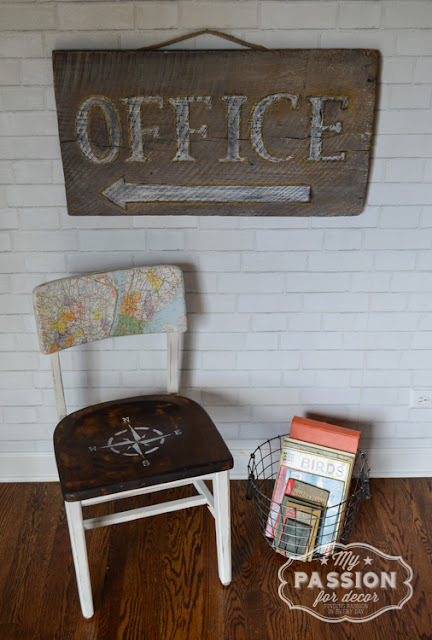 I think it would be perfect in a kid's room, play room or even family room for doing crafts, playing games, planning trips or dreaming about adventures. 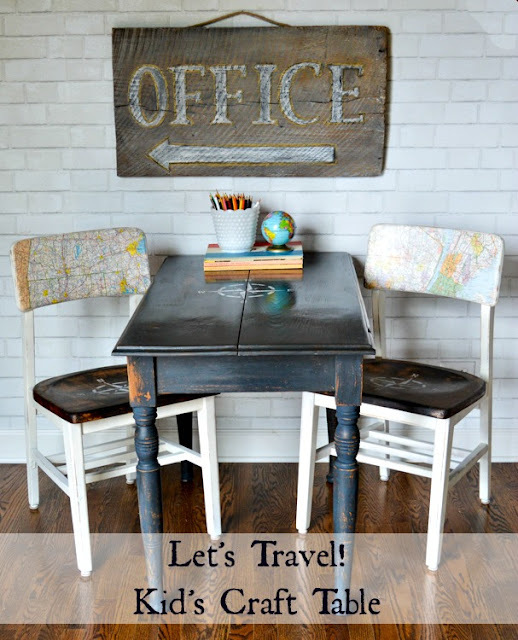 Here's what I'm calling this table....the Let's Travel! Kid's Craft Table and here it is! I'm a bit biased, but I LOVE how this turned out. Oh how I wish I had a place for this in my home! 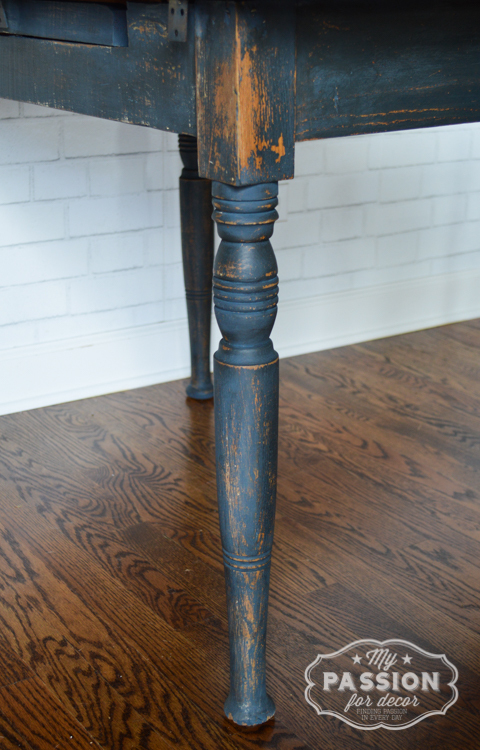 One of the reasons I love this table in MMS Artissmo milk paint.....look at those legs!! The paint has such depth of color and looks like it was painted many years ago. It wouldn't be right not to give the chairs a little attention would it?! I hope the table and chairs find a good home, where kids will draw pictures of places they visit and write about all their adventures. How about you, do you love to travel? Or do you prefer to stay close to home?